What are the cords that link us? Communities function within complex webs of connection. Think about your communities, the ones you love and the ones you hate—both feelings often live side by side in the realm of community—and sense into these connections. Some are blatantly overt and others more subtle. Some are matter of fact and some are mysterious. Some connections come from the practical side of life and others are linked to the heart. The Aquarius intention* of becoming more mindful of the place of community in our lives for this lunar cycle is now being colored by a strong shift into the energy of Pisces. This mutable water sign is expert at sensing connection. Encouraged by this sensitivity, we dive into the ocean together. And though it can be hard to retrieve a conscious thought from this sea, with intention and mindfulness we have the opportunity to understand our selves and our communities in much deeper ways. Pisces’ intuitive gifts help us develop the sensitivity to understand currents of feelings within community. However, to make these messages more useful, we benefit from developing practices that encourage us to question the messages we are receiving. You could say that it helps to put our feelings into analysis, finding some way to sort them out, to check out their truthfulness and usefulness. Some of our messages aren’t useful to anyone else in community but ourselves. So how can we tell? The gift of intuition is strengthened by discernment. The sign opposite to Pisces—mutable earth sign Virgo—anchors us in practices of discernment. The Full Moon in Virgo this week gives us the opportunity to find balance between insight and usefulness. The two days this week that the Moon is in Virgo will give us important information about how to achieve this balance. Forecast February 24, 2013 – March 2. Sunday, February 24. Give yourself the gift of creative play today. You won’t regret letting go of outcome for once and surrendering to the fun of process. Get messy, take wrong turns, laugh at yourself, smile foolishly at others … Today’s Leo Moon, under the influence of a newly-retrograde Mercury in Pisces, encourages us to step into the flow to find our distinct gift of spirit. We have greater impact than we think, use that power to bring light to others. Who does that for you? That person is your teacher. 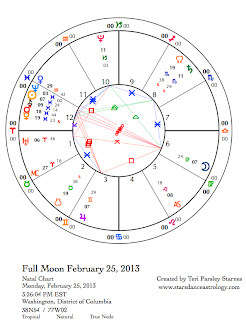 February 25—Full Moon: Illuminating. If you have any tendency to get overwhelmed by big feelings and big ideas, then this Full Moon should be a wonderful opportunity to bring awareness to what helps you to ground and center in the midst of all that. Mutable signs are emphasized in the chart for the Full Moon. The Sun and four other “planets” (when we include Chiron) are in Pisces, the Moon opposes in Virgo, and Jupiter in Gemini is exactly square to the Sun and Moon. Mutable signs love discovery, love learning, crave integration, but sometimes under this influence we can get over stimulated and lose all those wonderful new insights. Big stuff is all around us, how do you discern (Virgo word, right?) what is truly important? Time to practice letting go of what doesn’t serve overall intention. Another possible response to being overwhelmed is the attraction of checking out entirely. Sometimes too much input makes us want to turn off our senses altogether. When this happens the other side of Pisces—escapism, addictive behavior, and even martyrdom—can surface. My suggestion is to take notice when you want to deaden feelings and a find a way to accept even that. This expansion helps to create more room for our whole selves. As we expand into that, community also can expand into accepting more reality too. One of the most troubling aspects of community can be the tendency to conform and limit what individuals are able to do within community. If we practice acceptance within, we are able to extend that acceptance to others. Later today, Venus joins the other planets in Pisces. It’s a love fest! Or is it? What do you feel? How do you accept those feelings without judgment? How do you discern what information is useful? Another side of Virgo, which may help us all, is the path of the dedicant. What will you devote your journey to? How will you acknowledge your devotion? There is surprising comfort in remembering your intention. Tuesday, February 26. Moon, Mars, and Mercury are having a conversation today. Due to retrograde motion of Mercury, this is the second time that Mercury and Mars have joined together. The first time was on February 8. The third time occurs after Mercury turns direct and catches back up with Mars on May 7. This connection between Mercury and Mars is a significant signature for this particular Mercury retrograde cycle. What might we learn about our wills, passions, and tempers during this period? Mars in Pisces is a great time to develop empathy. Yet, it can be a hard time to know when and how to act on personal desire. Are we forcing too much? Not enough? We are not alone; others share the same questions. Notice the fuse on your temper. Mercury might provoke outbursts today. The Virgo Moon encourages balance and then we let go when the Moon goes void-of-course at noon for the rest of the day. Wednesday, February 27. Chiron’s transit through Pisces can bring up many themes around wounds, from the personal to the collective. As the Sun joins Chiron today, notice these. Chiron’s mission is to make us aware of what needs healing. In the sign of Pisces, we become aware of the wounds to our oceans, rivers, and lakes. All water is sacred. Perhaps personal healing depends on realizing that we must also heal these waters. We are interdependent. When the Moon opposes Uranus today, we are sparked to act, especially to achieve justice and fairness. Thursday, February 28. Under Piscean influence, we can open to a lot of emotion from others. Psychic antennas go up, we can be awash with feelings that we can’t fully process. When this happens, it is good to take time out for solitude, silence, and restoration. Today, take a little time for your self. The Moon is void-of-course all day. That means it may be hard to get a full head of steam going for any projects or activities you have planned. Merge with the flow today and see where it takes you. As Venus also joins Neptune, expansive feelings of love, compassion, and bliss are possible. The other side that may also surface is sadness and disappointment. Be loving towards what is showing up for you. March 1—Disseminating Moon: Sharing. There is a distinct difference between the signs of Pisces and Scorpio, even though they are both water signs. Being a fixed water sign, Scorpio brings perhaps a little more grit to a flowing situation. Today’s signature energy comes from the relationship between these two water signs. We get to apply this energy to this next phase of our lunar intention to be mindful of community’s place in our lives. Looking back over the lunar cycle since it began on February 10, what have you learned about navigating the waters of community? For this has been a watery experience and continues to be. Even in unconscious ways, we are developing new skills. The Sun trines Saturn in Scorpio and makes a sextile aspect to Pluto in Capricorn. We can know what we feel and give it definition. Things are a little less nebulous. Notice the concrete ways you use emotion to create and manifest. Fluidity can also be a strength. Saturday, March 2. Boundaries. Is it time to think about your boundaries in your relationships? Scorpio reminds us that there is a good reason to step out of the communal waters long enough to make sure we haven’t surrendered our essential truths to the collective. Feel good about establishing good boundaries. They help us to be effectively compassionate towards others. 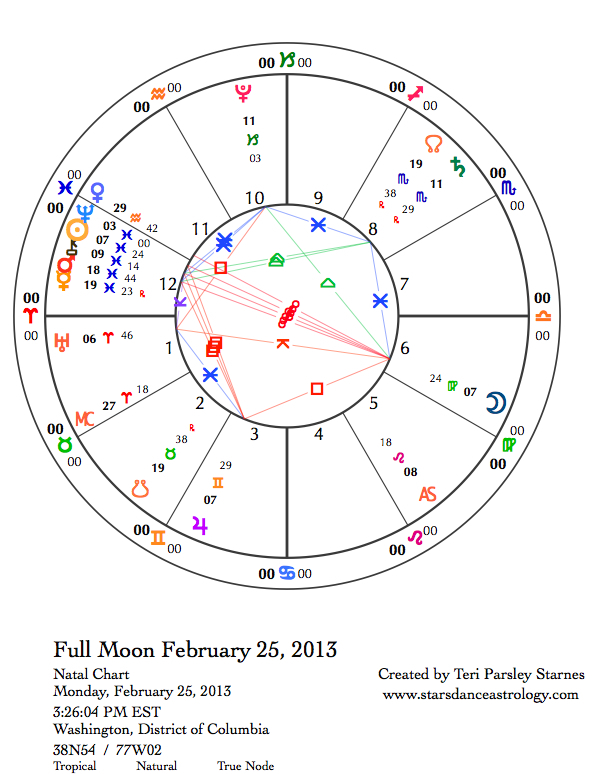 Follow the Moon: Forecast February 17, 2013 – February 23. 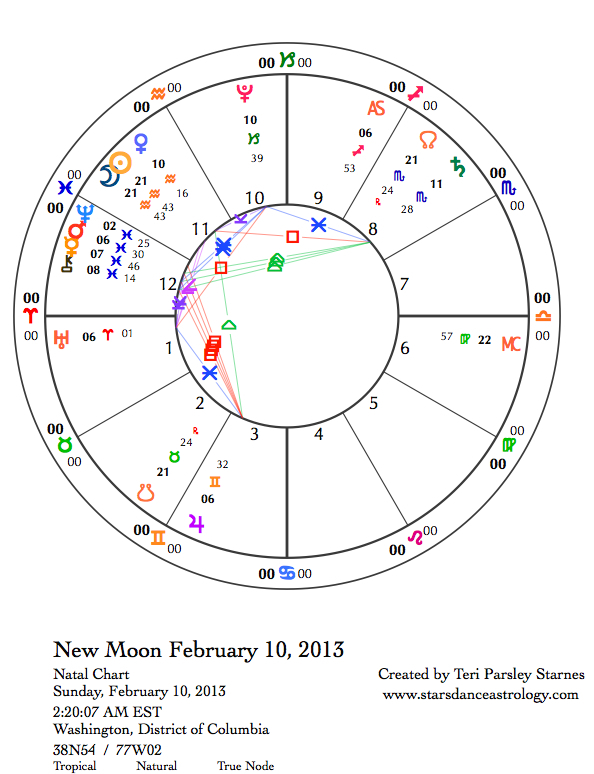 Follow the Moon: Forecast February 10, 2013 – February 16. Love or hate? What is your reaction when you see the word, community? Are you so immersed in it that you don’t even realize that another way of life exists or do you recoil from community, remembering past disappointments and dysfunctions that can be found there? Do you grudgingly feel that community is a necessary part of life, but wished it wasn’t? Or do you fully embrace all the gifts and foibles that come with communal experiences? Some of us willingly love community, some of us hate it, but all of us need community. Not only do communities help us survive but communities also help us to live lives that are more beautiful, meaningful, and responsible to the rest of creation. People are a better species when we are in community, or at least we have the potential to be. This potential draws us into the visionary realms of Aquarius where the hope for what could be often outweighs the reality of what has been. Aquarius is a creative sign, and is especially concerned with the type of creativity that helps community realize its potential. So, we find both organizers, rebels, and scientists under the Aquarius purview. Some Aquarian types like to be right in the center of community concerns, while others walk the edges of community, offering the perspective of the outsider or the challenger to community assumptions. Just as every community needs many people to serve different roles, Aquarius shows us the many ways to approach community itself. Many Aquarians say that they can’t stand community, but still the pull of the ideal, which can only be accomplished through collective action and intricate webs of dependency and inspiration, draws us back into the fold. Many gifts wait for us in the communal experience. Will you dare to commit to the search for those gifts this lunar cycle? Forecast February 10, 2013 – February 16. February 10—New Moon: Dreaming. The New Moon in Aquarius gives us the opportunity to explore the realm of community more deeply. 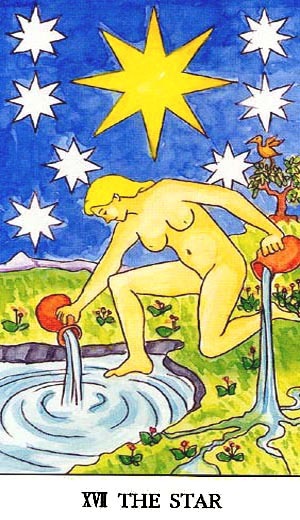 The constellation for Aquarius is known as the Water Bearer, an image shown in the Tarot card that represents Aquarius. The Star card shows the Aquarian desire to collect vision and pour it out for the collective good. Although the image is one of water, this Fixed Air sign is happily a conduit for ideas. Sometimes, it can be hard to cut off the flow, other times the fixity of the sign gets stuck in opinions so strongly, that it can forget that there are other valid points of view. Frustrations can arise quickly when the flow is stopped by the reality of human limitations. However, just as frustrating as humans can be, this humanistic sign believes that we are all co-creators and divine beings. The New Moon dreamtime evokes Aquarius. Here are some questions to consider at this phase of the Moon. What visions fill your cup? What helps you to contain these visions until they are ready to be poured out? What role does community play in your life? What role do you play in community? In the New Moon chart, Venus in Aquarius is square to Saturn in Scorpio. Venus is the goddess in the Star card. She invites us to express our Aquarian idealism in beautiful ways. She reminds us how fascinating and lovely community can be. Saturn in Scorpio presents a challenge to the Aquarian vision. Not everything we experience in community is pleasant. Sometimes secrets are kept; sometimes they are exposed. Sometimes people’s motivations are less than ideal. Power struggles happen. We experience limitations or a dislike of certain members in our communities. In these challenging times, vision doesn’t hold up to the grim realities. What do you do about those realities? What serve your communities and what causes more harm? The trick is to embrace the information we are receiving and see how it can strengthen our capacity to acknowledge that these things exist. Communities, just like individuals, have life cycles. Saturn in Scorpio encourages our communities to grow up. It is good to be aware of what is really going on and to find ways to address concerns. An emphasis on Mutable energy (signs of Pisces and Gemini) in this chart points to a desire to integrate and understand. This is important to gathering the wisdom of the square between Venus and Saturn. Since so many planets are in the water sign, Pisces, primary understanding comes from the emotional realm. We will be challenged to uphold good boundaries in community and communication may be confused by projections. The square from the Pisces planets—Neptune, Mars, Mercury and Chiron—to Jupiter in Gemini says that it may be hard to acknowledge the feeling realm and the thinking realm equally. Practice taking a moment to let emotions cool before assuming you understand what others mean. Taking inspiration from the Star card, elevate your visions to serve the common good. The Sun and Moon are square to the Nodes of the Moon (North Node is at 21 Scorpio/South Node is at 21 Taurus). This heightens a sense of needing to manage the experiences in this lunar cycle that pertain to community. Notice any attachments that that surface. Where are you stuck? The growing edge is to acknowledge what is brewing under the surface in our communities and in our relationship to community. Monday, February 11. Yes, it is true we can know how others feel without saying a word, but this may not be the best day to not use our words. The Moon joins the line up of planets in Pisces today. This is a perfect opportunity to notice where intuition helps and where it doesn’t. Seek clarity to support your feelings and your knowledge will be deeper and truer. Our boundaries are thinning. This can invite ecstasy and illusion. Welcome the adventure of learning the difference. Moon enters Aries 7:51 pm. Tuesday, February 12. Hearts are wide open as Mars joins Chiron. It is easy to feel others’ pain and we want to act to heal that pain. Notice communication styles that rely on emotional intelligence. If that isn’t your primary way of relating, there is a lot you can learn today. The Moon is void-of-course for most of the day, so the dreamy quality of the day seems to envelope us until the evening when we get a jolt from the Moon’s entry into Aries. February 13—Crescent Moon: Beginning. This phase of the Moon fills our hearts with the hope that action can bring change. 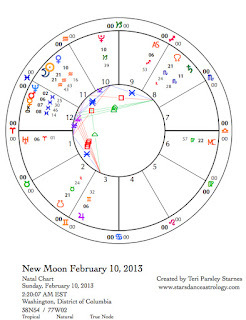 Before we’ve experienced any challenges to our New Moon intention, we are filled with excitement for what comes next. After a few dreamy days while the Moon traveled through Pisces, we feel like getting something started! What will it be for you? Can you take that passion and apply it to the health of your communities? This is a good day to realize that collective action has power. Notice the tension between the desire to individuate and the desire to belong. Not all is smooth sailing as we work together to change the world. Notice how you deal with friction today. Thursday, February 14. Valentine’s Day. Although Aries is known as the sign of the maverick, it doesn’t mean that we can only be true to our individuality at the expense of our relationships. This Valentine’s Day will be about welcoming independence into our partnerships. If we let go of defensiveness and over-attachment, freedom can be quite an aphrodisiac. Moon enters Taurus 4:08 am. Friday, February 15. As the Moon enters Taurus, we seek to create stability for our New Moon intentions. Notice what your body is telling you. The needs and pleasures of the body are excellent teachers instructing us how to listen to the needs in our communities for stability and security. These are simple and profound desires. What systems create sustainability? How do we insure that needs addressed and values upheld? The favorable aspects today support receiving real answers to these questions. Saturday, February 16. Another day to notice the benefits from feeling grounded in our bodies. Take it a little deeper and notice whether attachments to comfort, pleasure, and security also have within an element of fear. Can you master the ability to enjoy materiality without fearing its loss? Saturn in Scorpio hints that we need to be balanced between acquiring things and letting them all go. Being aware that material things are temporal makes them all the more precious. We need that balance in our communities too. There is no such thing as perfect security.